A gigantic alien is wreaking havoc in the city! Send your squad to collect alien samples before the army blasts the monster back into space. However, your competition is fierce. 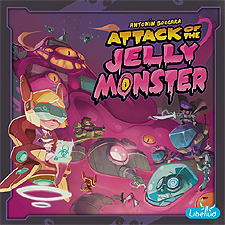 Overcome the chaos, be clever, and hustle your way to victory by collecting the most jelly. Become the best Jelly squad! Roll your dice and place ONE of the on a district of your choice. Act quickly! Don't wait for your opponents to roll and place your dice! At the end of the round, gain the reward of each district you control.